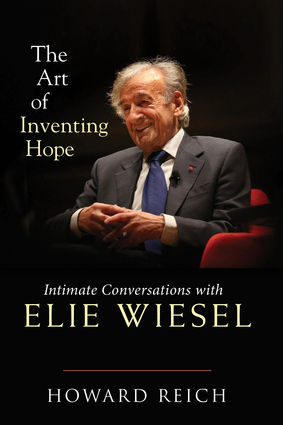 The Art of Inventing Hope offers an unprecedented, in-depth conversation between the world's most revered Holocaust survivor, Elie Wiesel, and a son of survivors, Howard Reich. During the last four years of Wiesel's life, he met frequently with Reich in New York, Chicago and Florida—and spoke with him often on the phone—to discuss the subject that linked them: Reich's father, Robert Reich, and Wiesel were both liberated from the Buchenwald death camp on April 11, 1945. What had started as an interview assignment from the Chicago Tribune quickly evolved into a friendship and a partnership. Reich and Wiesel believed their colloquy represented a unique exchange between two generations deeply affected by a cataclysmic event. Wiesel said to Reich, "I've never done anything like this before," and after reading the final book, asked him not to change a word. Here Wiesel—at the end of his life—looks back on his ideas and writings on the Holocaust, synthesizing them in his conversations with Reich. The insights on life, ethics, and memory that Wiesel offers and Reich illuminates will not only help the children and grandchildren of Holocaust survivors understand their painful inheritance, but will benefit everyone, young or old. Howard Reich has written for the Chicago Tribune since 1978 and joined the staff in 1983. He is the author of five other books, including Prisoner of Her Past: A Son's Memoir. Reich has won an Emmy Award, and the Chicago Journalists Association named him Chicago Journalist of the Year in 2011.